It was one of the most enjoyable travel evening that I can remember – there we were, in this quiet little village of Honsa in northern Laos, eating well and drinking Beerlao. travellers want to go in Asia: China, Burma, Vietnam, Cambodia, Thailand ... an endless tally with good stories to match. Then there was this interesting Dutch guy. He works in Amsterdam a few months each year and that pays for his South East Asia life for the rest of the year, a Cambodian wife and son and an ex in Thailand and their son. He was travelling with both boys, who wanted to see his other life. Neither boy could understand the other because one spoke Khmer and the other Thai. But they got along fine. There was a French lad, looking somewhat up against it and admitting he was running out of money to get back to Bangkok for his flight home. He'd travelled by Siberian express to China and then turned south into South East Asia. I had been through west and north Thailand and then followed the Mekong down to Honsa. 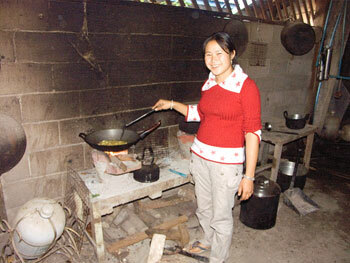 Touny, who runs the Villa Sisouphanh with her husband Geen and family members, had used the charcoal burners in her kitchen to prepare us a variety of dishes, including our vegan options. Apart from running the guesthouse, doing much of the cooking and looking after her one-year-old son Bill, she also works as an English teacher in the village school. Geen doubles up at the 4WD driver and Bill's grandmothers help out where they can ... including looking after him. The Dutch group vanished on their way and the last we heard Derek was walking to the Mekong – a great experience - with a local guide. We idled away some time at breakfast with some very agreeable Thai business men ... Laos is becoming a good place to expand into, apparently. One spoke good English and filled us in with lots of local knowledge, from what had happened to the elephants to the price of the Chinese motorcycles. You would think that was pretty awful and, normally, you would be right. But this time, after the tension of landing up in the middle of people already crammed in, it was thoroughly enjoyable and interesting. There was a Kiwi dad & daughter duo, shivering in the unexpected cold but warm-hearted enough to move up and give me a perch. They were doing a recce together before she went solo with a friend and he went home ... to plan another Laos trip next year. And there were two Australian documentary film-makers who had been working in Thailand and were taking a slow and enjoyable route home. 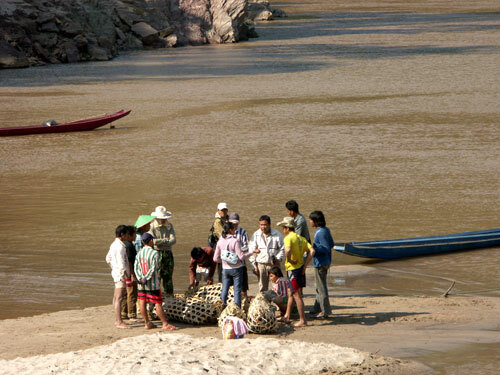 “We thought you were missionaries,” said one, who had seen us on this remote Mekong ‘beach' waiting with the locals and their goods and their ducks and chickens for sale in Luang Prabang. They made a bit more room and June squeezed on to a step and chatted to them. In ‘first class' – on padded seats ... what bliss – were a mixed bunch of Austrian, Dutch and French people: good travellers ready for a yak about far away places, photography, politics ... you name it. And just behind the women from Oz, there was a British man sporting a copy of The Guardian and his companion or wife or both. He kindly offered me the loan of his Guardian but I'd just finished working there for 25 years and so I made an excuse and left (well, not exactly ‘left'; there wasn't room to turn let alone leave). The dad fought his way to the back of the boat for his own bottle of Beerlao and his daughter gamely tried out her new camera on the scenery; the Aussie pair shared a Beerlao and shot a few stills; and the padded seats sighed as occupants shifted round to chat. We all had a go an photographing the fast boats but, mostly, they were too fast. We passed Pak Ou to general acclaim and finally arrived at Luang Prabang's slow boat jetty, magnificent compared with Pakbeng but then Luang Prabang is a jewel compared with anywhere else in Laos. As we staggered up the jetty to the waiting sawnthaews, we said hasty goodbyes. We need not have bothered ... we all kept meeting in the City of Temples for the next couple of days.